Do you ever get tired of manually changing the default alarm sound in iCal from “Basso” to something of your choice? Do you hate having an alarm sound at all? Take care of this annoyance once and for all. So you’ve configured iCal to add a default alarm to all of your new events by going to iCal > Preferences > General and checking the appropriate box. Then you put in your desired warning time in minutes before the event’s start time. [Quick tip: Try putting something like 1440 minutes (24 hours x 60 minutes) to give yourself a full day or more before the alarm goes off]. Perfect, your default alarm is all set up! Except every alarm has the “Basso” sound effect attached to it. If you prefer to use another sound effect, you have to manually change it every time you create an event. And if you just want “Message” instead of “Message with Sound” as your alarm, you have to do that manually too. At that point, why even bother with an automated alarm in the first place? Don’t give up quite yet – there are ways of getting what you want, even if iCal makes it difficult. 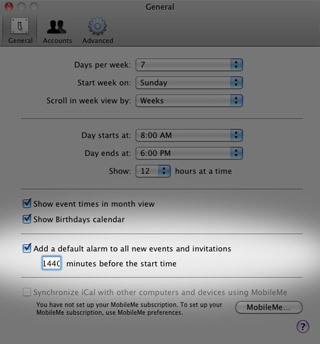 Before diving in, make sure you have a default alarm configured in iCal’s preferences, as described above. If you would like to use one of Mac OS X’s system sounds (other than “Basso”) for your alarm, make note of its name and skip to Step 3. For those looking to use a custom sound effect, find one you like from your own collection or somewhere online. It can come from any source but should be short – no more than a few seconds at most. It also needs to be in AIFF format, which can be accomplished with a free converter like iTunes or Switch. When you have your AIFF audio file, use Finder to copy it to ~/Library/Sounds in your home folder. If there isn’t a Sounds folder already there, you can create one yourself. If you’re like me and don’t like any sound at all when iCal throws up a notification, I’m sorry to say there doesn’t appear to be an official way of setting a silent default alarm. What we can do, though, is use a blank sound file to trick iCal into thinking it’s making noise when it’s really not. Feel free to download the silent audio file I use myself (“Blank.aiff“) and save it to ~/Library/Sounds in your home folder. There are dedicated tools for editing Mac OS X preference files, but most people won’t be doing something like this very often and therefore don’t need to install an application for one-time use. So we’re going to use just the tools built in to every Mac. The second line refers to “Blank.aiff” – the silent audio file I created. Replace it with the name of whatever sound effect you’re using, whether it is a pre-existing Mac OS X system sound or your own custom file. Make sure it’s just the name, though, not the file extension or path. Save the .plist file in TextEdit and restart iCal. When you create a new event, your chosen alarm sound should be selected there instead of the standard “Basso”. Does not work for me. When I restart iCal, it just re-converts the plist or creates a new file. In any case, my custom setting is gone. Maybe I should convert the file back to plist before I restart iCal? You shouldn’t have to do any converting of files other than running the Terminal command before you open it in TextEdit. Make sure you just save the .plist file (overwriting the old one) when you’re done, rather than saving as a new file. It might also help to have iCal closed while you’re working with the preference file. Awesome! 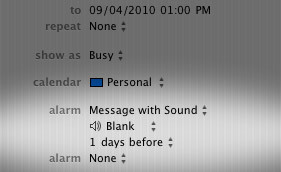 I can’t tell you how annoying it was to have my iMac wake me up at night with an iCal alarm for something the next day. Now I can sleep in peace and just see the alarm message after I wake up. thanks sooo much for this! i recorded myself making a noise and now it’s my ical alarm. way cooler than the ones apple gives you! Sorry. Spent an hour doing this over and over. Keeps reverting back to original default settings. Followed all instructions; saved the file replacing the old one, etc. Still no luck! Thanks for a great tip. It took only a few minutes to do and it works fine! same issue of KD! How can i delete iCal prefs? The script worked perfectly. Thank you, thank you. If you want to have the default alarm ring AFTER 11PM, use a negative number in the “minutes before the start time” box in the iCal Preferences Panel. For example, 8AM on the day OF the event is -480 minutes. So, which insomniac at Apple thought that the whole world would want to receive an alarm at 11PM the night before whole-day events? Does anyone know how I would change default alarm from message with sound to just message. I know you can add the blank file to not have a sound, but I want it to be message so it will sync with my gmail account. Did anyone have an answer for Matt? I want to change the default alarm to sending me an email message instead. How to do it? Thx! I’ve tried to use the command but the plist file does not appear. I’m on the latest version of Lion, and I’ve tried over and over. Permissions issue maybe? Nevermind.. you have to first reveal your user Library folder (not the system folder ‘Library’) in Terminal. Google the command, then try this tutorial. Totally works! Has anyone tried this in Mountain Lion? The behaviour of alerts in Mountain=Lion Calendars seems to have changed somewhat. Before I, as an amateur, have a go at this, I wonder if any others can share their Mountain Lion experience. Now launch TextEdit and open the “com.apple.iCal.plist” file from ~/Library/Preferences in your home folder. that it worked, and I’ve not had a problem since – must have been a year or two ago.